Purchases of the tropical oil by India may surge about 10 per cent from a year earlier to 2.4 million metric tons in the October-December quarter on cheaper palm and tight domestic vegetable oil supplies, according to a Bloomberg survey of five buyers, traders and analysts. 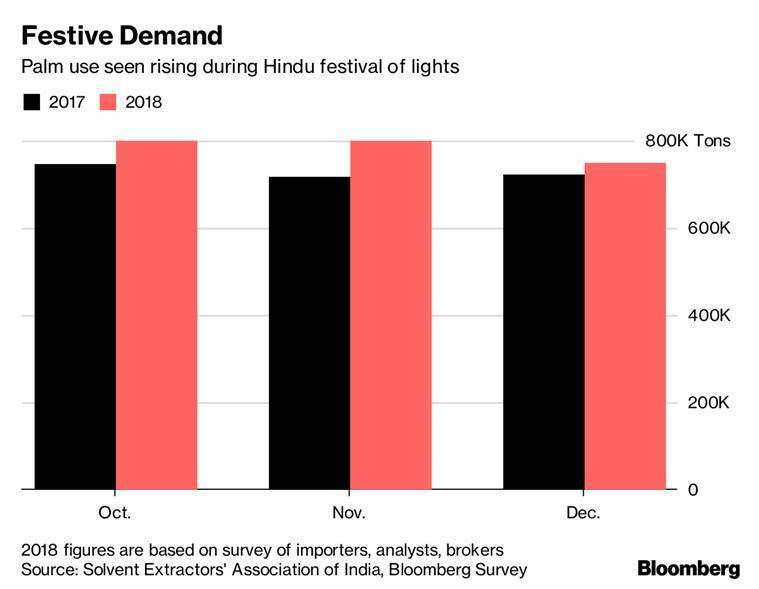 With production in top growers climbing and prices hovering near three-year lows, the last chance to arrest palm oil’s decline this year is Indian demand ahead of Diwali, the Hindu festival of lights that’ll be widely celebrated in the top importer in November. Purchases of the tropical oil by India may surge about 10 per cent from a year earlier to 2.4 million metric tons in the October-December quarter on cheaper palm and tight domestic vegetable oil supplies, according to a Bloomberg survey of five buyers, traders and analysts. That could underpin palm oil prices in Kuala Lumpur, which have lost about 12 per cent this year. 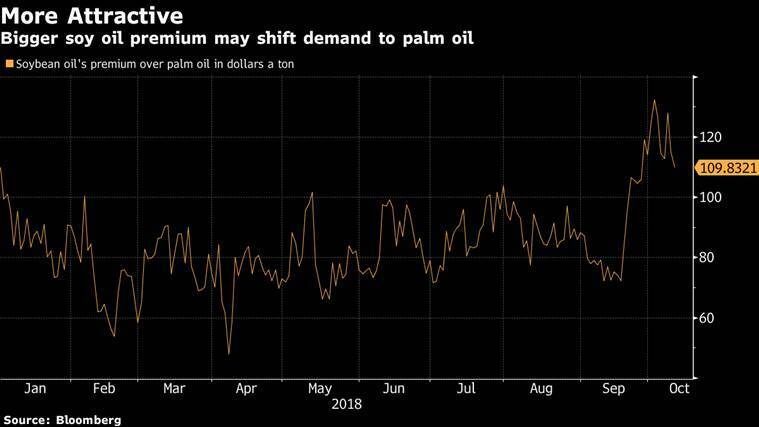 Palm oil prices are expected to average 2,220 ringgit ($535) a ton in the fourth quarter, said Oscar Tjakra, senior analyst for grains and oilseeds at Rabobank International. That compares with an average of about 2,660 ringgit a year earlier. Prices need to drop below 2,100 ringgit to make palm oil competitive and regain exports, Godrej International director Dorab Mistry said in Mumbai last month. Futures fell 0.5 percent to 2,193 ringgit a ton on Wednesday. Consumption typically climbs during Diwali as it’s used in cooking oil as well as to make festive treats such as biryani, and deep fried sweets like jalebi. Still, a record-low rupee could mean that India’s imports will not be as robust as initially expected because purchases of edible oils have become costlier. While a rally in oil prices has boosted prospects for biodiesel blending and cushioned palm oil, it’s made the rupee the worst-performing currency in Asia. Palm oil demand will be there but a sharply weaker rupee will affect India’s buying, said Rajesh Modi, a trader at Sprint Exim Pte. in Singapore. “So many companies will be in deep trouble because it’s more costly to buy any edible oil, whether it’s palm or soybean oil,” he said. India’s palm oil imports were initially expected to climb to around 950,000 tons in each month of the fourth quarter, but the rupee’s slump has shrunk the working capital of importers and could limit that, he said. The rupee, weighed by rising oil prices and a current account deficit that makes India dependent of foreign inflows, fell to the lowest on record this week, deepening this year’s losses to almost 14 percent.